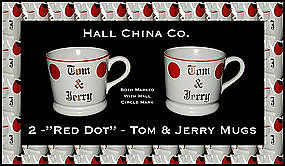 2 Red Dot Tom & Jerry mugs made by The Hall China Co. in the 1950's. 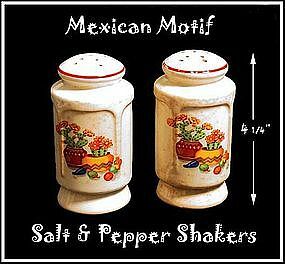 Retro kitchen items with very light use. Both signed Hall. 12 ounce straight side coffee mug in excellent condition. Longaberger used to be made by The Hall China Co. and this is a Hall piece. 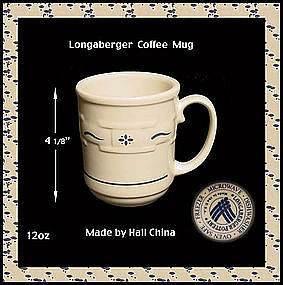 Longaberger Pottery is now made in China. Excellent condition with no damage and no repairs. We think this pattern is called Blue Woven. 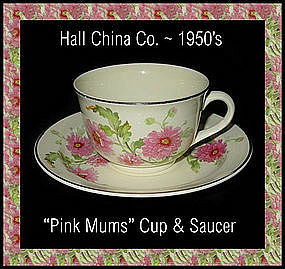 Hall China Pink Mums pattern cup and saucer set. Good condition with good platinum trim too! 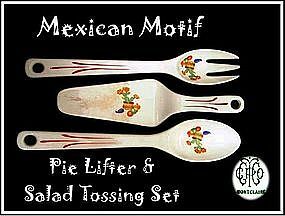 We have more of this pattern that we will be listing soon. 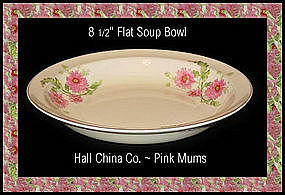 Flat soup bowl in Pink Mums pattern by The Hall chia Co. in the 1950's. Very minor use. No chips, and good platinum trim. 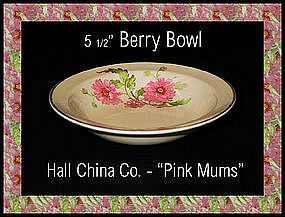 Pink Mums berry bowl by The Hall China Co. in the 1950's. Great condition with good platinum trim. Signed Hall. 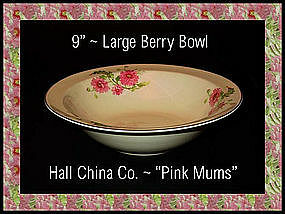 Pink Mums large 9 inch berry bowl. Excllent condition with good platinum trim. Signed Hall. 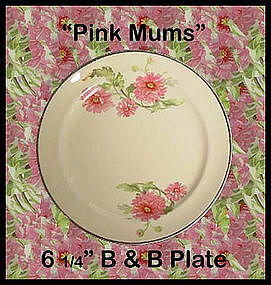 Hall China Pink Mums 6 inch bread & butter plate. No chips, no repairs. 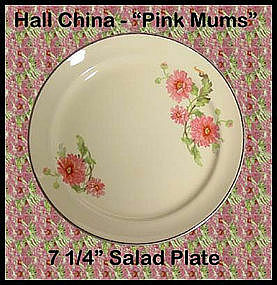 Pink Mums 7 1/4" salad plate made by Hall China Co. Excellent condition with no damage and no repairs. 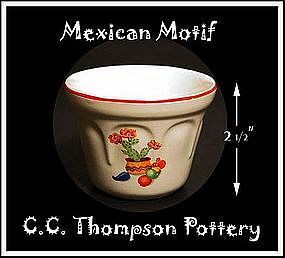 1940's Mexican Motif Ribbed Custard dish made by C.C. Thompson Co. Ovenproof. All 4 are in excellent condition with no damage, & good red trim. If you buy all 4, there are 2 extra ones with some brown spotting. 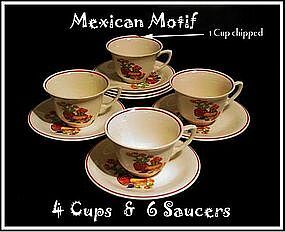 Same pattern as our other Mexican china. 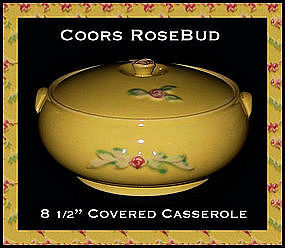 Yellow Rose Bud casserole and lid made in the 1940's by Coors, (The Beer Company). Excellent condition with normal light interior crazing on the base. 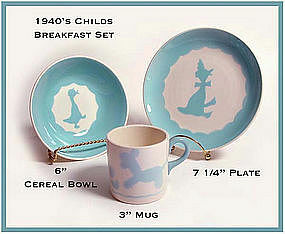 1940's ~ 1950's Childs 3pc china breakfast set with animals in excellent condition. Cup looks lighter than the other 2 pcs but is not as severe as photo seems it to be. Mugs shows a lamb, bowl and plate shows a duck. Sweet! 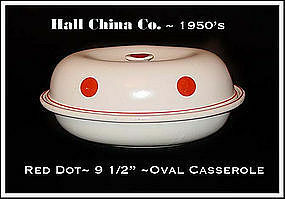 1950s Red Dot deco oval casserole by Hall China Co. Signed in 2 places on bottom. Used, but not abused. No chips, trim good. 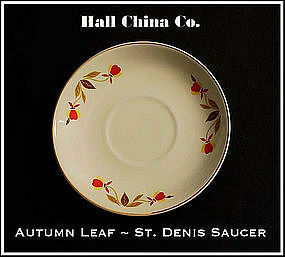 Autumn Leaf pattern, harder to find, St. Denis "He Man" saucer only made by the Hall China Co. Good gold trim and no damage. 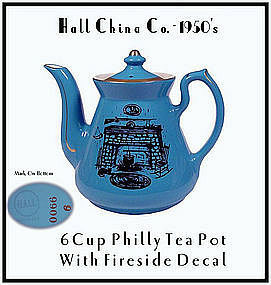 1950's Philadelphia style 6 cup tea pot with fireside decoration and gold trim. Excellent condition with no damage and no repairs. This was a special order, and a limited production with this decoration on it. 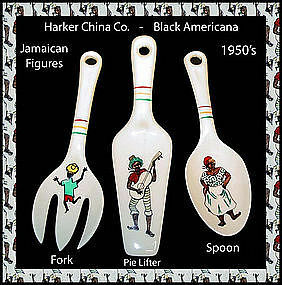 It was a Sears exclusive dating to the 1960's.